Korea Trade Insurance Corp. (K-sure) will increase its underwriting of trade insurance to 190 trillion won in support of expanding Korea’s total foreign trade to $1 trillion this year, President Yoo Chang-moo said at his New Year briefing with reporters on Jan. 24. Yoo said K-sure expanded its trade insurance coverage in the past couple of years to help the trading industry overcome the economic crisis. In the process, Korea’s exports grew to rank the 7th largest in the world. Export insurance coverage totaled 185 trillion won last year, double the figure of 2007, equivalent to 35 percent of total exports. The K-sure CEO pointed out that exports have been rising continuously for the past couple of years, but problems such as excessive dependence on a number of major products and countries and the imbalance between large exporters and SME exporters must be addressed to continue to keep exports growing at the present rate. Yoo said K-sure should help exporters investing in emerging markets, support globalization of SME exporters and the expansion of an export growth base by helping next generation export-driving machine industries. K-sure will provide all-out support to Korean exporters working in emerging markets as well as advanced countries. Global firms in those market countries will try to recover their market shares lost to Korean exporters, making the emerging markets a key battleground for Korean exporters where their further growth depends. K-sure’s strategies are tailor-made to each of those emerging market countries, which are divided into three categories: production base type, resources and infrastructure development type and consumer product market type. K-sure will provide trade insurance coverage based on those types and trade information to Korean exporters to support their operations, the CEO said. Most of K-sure’s insurance support would go to those countries coming up after the BRIC nations to pave the way for Korean exporters to explore those markets. The company plans to extend credit lines and advance payment finance, especially in those countries in Africa and Central and South America, with rich natural resources reserves, according to 78 percent of the SME exporters polled showing BRICs and other emerging countries to be major export markets for Korean products this year. Yoo said K-sure will strengthen its capacity to collect information on overseas markets, including credit information on importers and credit risks of market countries taking into consideration the results of the polls in which some 42.6 percent of SME exporters pointed out lack of information as a key impediment in their activities in emerging market countries. Credit risks of importers came next in the polls with 33.8 percent, securing trade financing followed with 14.6 percent and political risks came next with 5.5 percent. The trade insurance company will do everything it can to help SMEs expand their international trade, especially their cooperation with large trading companies for mutual growth. Its export financing to SME exporters will expand to 86 trillion won this year from 81 trillion won this year. Its export insurance coverage will be divided into two products including the comprehensive coverage and group coverage to facilitate their overseas export activities. The company will expand the number of its members in the Trade Champs Club to over 70 firms from 37 this year to make them strong small exporters in the world. K-sure will also expand the industries that can benefit from its export payment guarantee insurance to nuclear power plant, high-speed railroad and other government-sponsored industrial projects from shipbuilding, automobile, plant and IT industries. 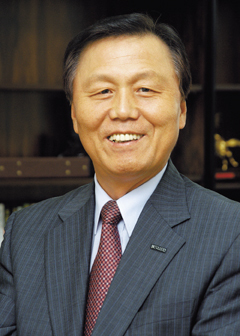 President Yoo Chang-moo of Korea Trade Insurance Corp.(K-sure).